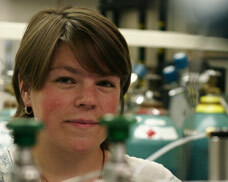 Geosciences student Julia Rosen will be blogging about ice core research in Greenland. To read about Julia Rosen’s research and day-to-day experiences on the ice sheet, read her blog, Transmissions from the Ice Sheet. Remote is one way to describe where geosciences Ph.D. student Julia Rosen is going. Cold would be another appropriate adjective. But neither is quite vivid enough to capture the atmosphere at the North Greenland Eemian Ice Core Drilling Project (NEEM) camp, where Rosen will be spending three weeks this summer, trying to help complete a picture of long term, global climate change. At 77.45°N, NEEM is more isolated than Rosen has ever been. The drill site is located on top of 2,500 meters (1.5 miles) of ice, hundreds of miles from the nearest piece of ice-free land. In order to go, Rosen had to undergo extensive physical and mental evaluations, and ensure that her wisdom teeth were removed — there’s no dentist around the corner from the snow pit where she’ll be working. The intensive preparations, however, will be worth it. Rosen is title to NEEM as a part of an international ice coring team aiming to retrieve a core that reaches back to earth’s previous interglacial period, the Eemian. As a member of geosciences professor Ed Brook’s lab, Rosen is planning on using samples from that core to analyze levels of nitrous oxide in the atmosphere. Knowing that can help Rosen map past levels of the greenhouse gas, records of which are currently less available than those of the more abundant carbon dioxide and methane. Getting a good nitrous oxide record will not only help reconstruct a picture of past climate change, but the data can also be used to develop climate models that can be used to predict future climate changes, as well. Models, Rosen says, should be able to accurately reproduce past climate changes if they will be used to predict the future. A history of nitrous oxide can be used either as an input for models that simulate global climate or as a target for biogeochemical models to reproduce. In Brook’s lab, Rosen is also trying to develop the best method to extract nitrous oxide from the tiny bubbles that are trapped in ancient polar ice. She’ll compare “wet” and “dry” methods for extracting gas, which are currently used for methane and carbon dioxide, to determine which, if either, works for nitrous oxide. While in Greenland, Rosen will be chronicling her experiences in the blog, Transmissions from the Ice Sheet. Be sure to check out her updates. There are many other great ice core research institutions, but only a few that work on greenhouse gases. And that’s why its great to research there.